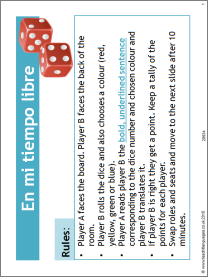 A pair work dice game to revise free time activities and the present tense of jugar, hacer and tocar. The aim is to translate the given sentences into English or Spanish to win the most points. Instructions included on the first slide.